Grown either as a loquat tree or a shrub, this fruiting plant is an interesting one. A relative of the rose, it makes small fruits which taste like a blend of peaches, citrus and mango, and some describe it as having a honey note. But most people have never tasted it and know virtually nothing about this unusual fruit or the lushly-tropical tree it grows on! I’m going to fix that right now, because loquats are delicious, nutritious, and quite fun to grow if you’re in the right climate to do it. These evergreen trees are a beautiful ornamental species, but when you add on the perk of having fresh fruit, it’s definitely worth growing! Temperature 45-85 degrees optimal. Fruit/flowers die off at 30 degrees, tree suffers lasting damage at temperatures around 10 degrees. Pests Scale insects and fruit flies most common. Less common are aphids and caterpillars. Birds will eat fruit, deer will eat fruit and leaves. Diseases Fire blight and pear blight possible. If the canopy is too densely packed with limited airflow, it can develop fungal leaf spot diseases. With an average top height of 30 feet, it can become a sizeable evergreen tree. However, it’s more commonly kept in the 10 to 15 foot range by commercial growers for ease in maintenance and harvesting. At the 10′ height, it is treated more like a dense, tree-like shrub. While there are as many as 800 cultivars available, they are all the same base species. Sometimes referred to as the Japanese plum, Chinese plum, or Japanese medlar, the tree and its fruit are called Pipa in China. In traditional Japanese and Chinese medicine, the fruit and the leaves of the loquat plum fruit tree are used for multiple different purposes. The Chinese use the fruit to make a syrup to ease coughs. 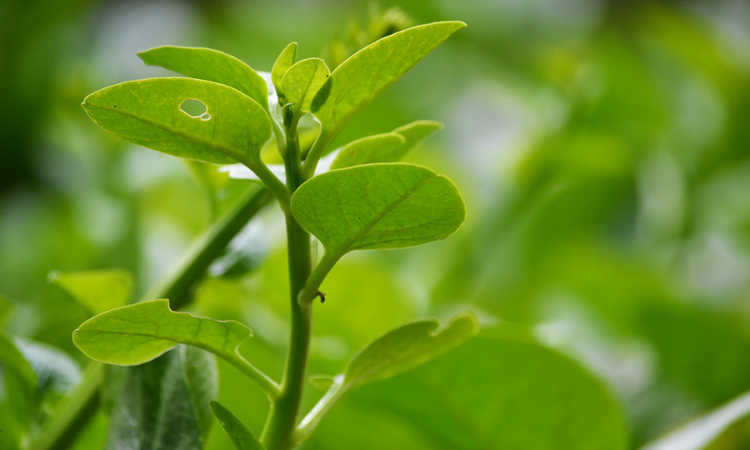 The leaves are used in Japan to make biwa cha, a beverage which is believed to help with skin conditions and help with bronchitis or other respiratory illnesses. Both the leaves and the seeds have small amounts of cyanogenic glycosides that release cyanide when digested. However, small amounts of these compounds rarely have any effect. It’s still good to avoid eating the seeds or the leaves, and to keep them away from children and pets. At the end of a warm summer, the loquat plum tree will begin to develop flowers as fall approaches. It forms its flowers on the tips of new growth branches that are younger than 6 months old, and the flowers are in pannicles or clusters. These flowers often carry a sweet tropical scent around your yard during warm fall afternoons which is quite enjoyable! As many as a hundred flowers can form on a single pannicle, but that doesn’t mean it’ll produce a hundred fruits from that cluster. Typically, there will be between forty and sixty flowers on a pannicle, with 10-12 fruits developing at that spot. If you find your tree appears to be setting a lot of fruit, this is a good time to prune off some of the excess to ensure you have larger, healthy fruits instead of a bunch of tiny ones. As individual blossoms begin to swell into fruit, it’s also important to keep your tree warm. A cold snap can cause the flowers or fruit to fall off the tree. Avoid temperatures dropping below 30 degrees if at all possible. Fruit should be allowed to ripen on the tree, as it develops all of its sweetness and flavor during that ripening period. When it is ripe, the fruit softens up, and generally the entire tree will become ripe at or around the same period of time. Post-harvest, the tree recovers during the rest of the spring, sending up new shoots and growth from spring into summer. Once fall comes back around, it’s time for flowering again. Flowering may not be consistent from year to year, and fruit set may vary. Some years may have a heavy harvest where others are much smaller. It depends on the weather conditions as to how well your loquat tree will produce annually. 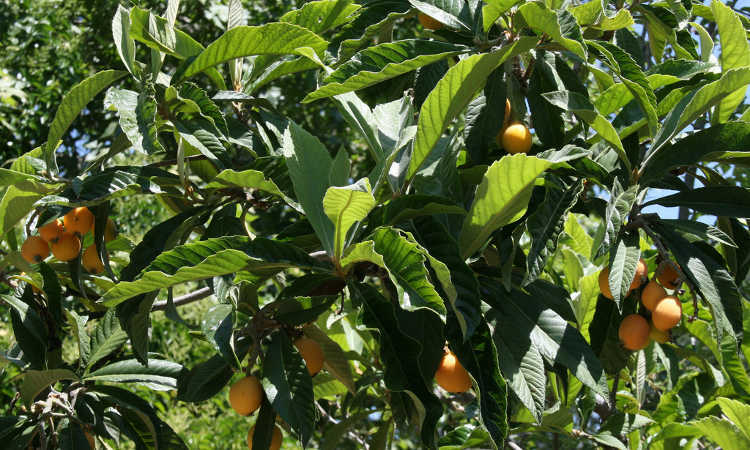 Typically preferring tropical climates, loquat plum trees are easy to care for once established. If you keep them in the right temperature range, they will provide beautiful dark green foliage and shade year-round. Let’s go over the perfect conditions for growing your loquat tree! This tree should be grown in a full sun to part shade environment, and does best in zones 8-10. This means that much of California is perfect for growing these tangy-sweet small fruits, as well as much of the south or southeastern part of the United States. Often, loquats are grown as a shade cover for patios, and they can be shaped into espalier patterns. If placed in the right location, you may be able to get a little shade on your japanese plum during the hottest portions of summer, which can be beneficial to the tree’s growth. 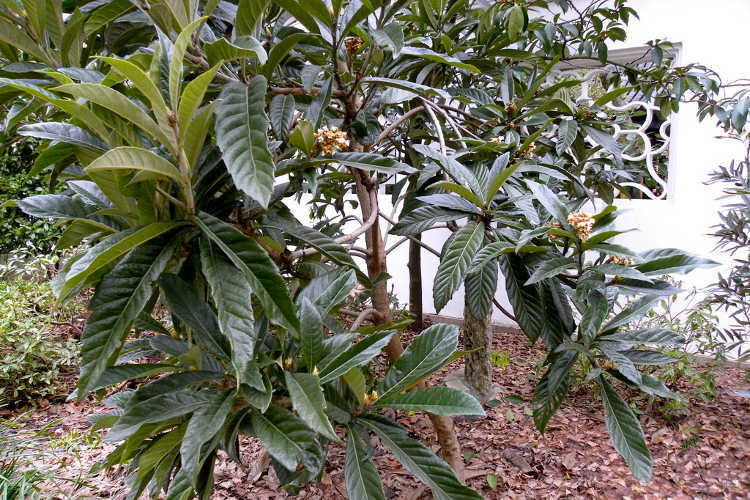 It is possible to grow loquats in containers. These will remain small and compact, and can be placed outdoors when the weather is optimal and moved inside under a bright grow light when the temperatures are too cold. Surprisingly sensitive to temperature, they can be grown as ornamentals in areas where it gets as low as 10 degrees Fahrenheit. However, the fruit and flowers will fall off the tree at temperatures below 30 degrees, making it impossible for it to bear fruit. If grown as a container plant in small form, you have the option of moving it indoors when the weather is too cold to protect the fruit and flowers. Hot weather also becomes a problem. In temperatures of over 95 degrees, they suffer leaf-scorch and may have difficulties growing. It’s essential to provide supplemental watering during the hot summer months to alleviate these difficulties. 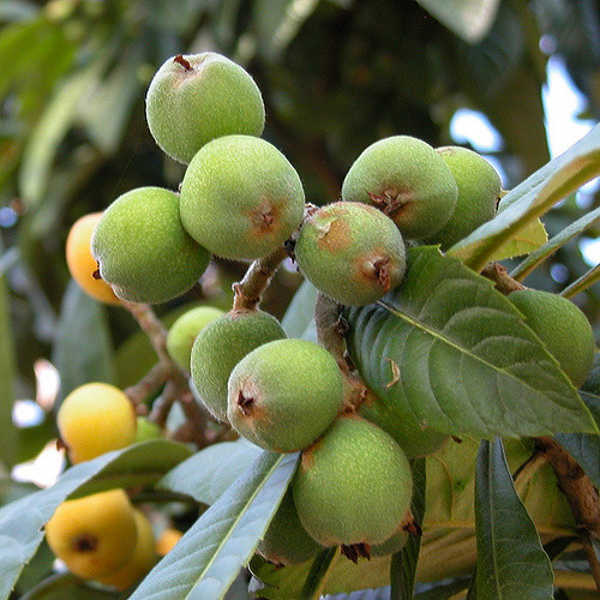 In their native Asian environments, loquats naturally thrive in a much more humid environment than they would in desert California or the southwestern half of the United States. Some cultivars have been developed which do well in lower-humidity conditions. In the first year after planting a new tree, it’s important to water more heavily than you would otherwise. Water 3-4 times a week for the first two weeks, and then gradually and slowly reduce the watering frequency until it’s become established. As a general rule, loquat trees planted in the ground will do well if local rain totals are between 20-45 inches per year. At the lower end of that range, it can benefit from additional watering at certain periods of time. When the blossoms begin to swell into fruit in the spring, give it a long, slow seeping of water. This can be done with a drip hose, allowing the moisture to slowly seep through the soil around the tree’s roots. Stop if the water begins to run off. Repeat this process another few times as the fruit begins to ripen to ensure it’s sweet and juicy, but only if you’re not having regular rain then. If you’re getting plenty of rain, additional water will not help. During the heat of the summer, a weekly deep and slow watering will help your tree withstand the scorching rays of the sun. This is most important during weather that is 95 degrees or hotter. Again, a drip hose is very useful for this purpose, as it avoids splashing water around. Mulching around the base of your tree during the summer months is also beneficial, as it keeps the moisture in the ground where the tree makes use of it. Your loquat tree prefers a soil which drains well, but it is less picky than some plants are as to the soil makeup as long as it’s not salinated. The pH level of the soil is not much of a concern, as loquats grow well in both acidic and alkaline soils. I recommend thoroughly loosening the soil in a four to five foot circle around where you’re planting your tree, going down at least 18″ below the soil surface. 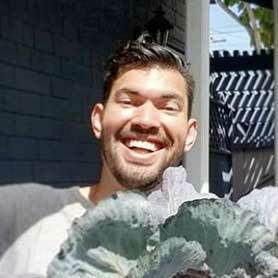 You can amend your soil with compost at this time if desired. Poor drainage can cause your tree’s roots to struggle. 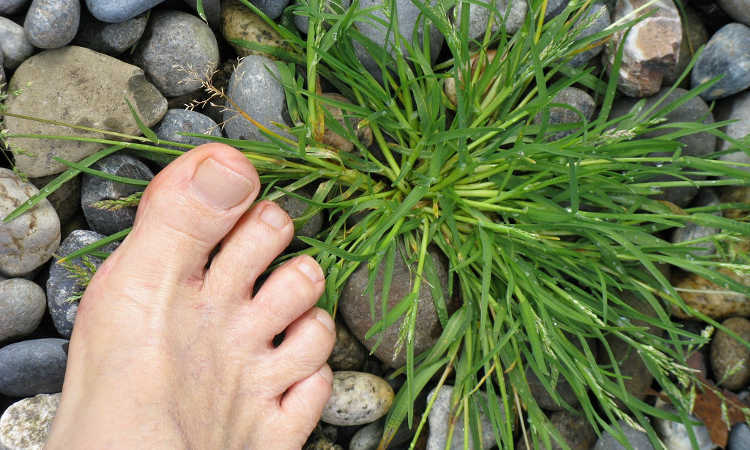 If your soil is too clay-like, you may have to amend a wider area to provide good runoff. Your loquat will not like being in standing water for very long! A slow-release granular fertilizer suitable for fruit trees will work just fine. Aim towards varieties intended to nourish apples, quinces, or pear trees, as these are closely related. If you don’t have access to a fruit tree fertilizer, you can use a standard lawn fertilizer provided that it doesn’t have any weed preventative or weed killers mixed in. The first year, three applications of fertilizer spread throughout the year should suffice, but wait until the tree has become somewhat established before doing the first fertilizing. You want the roots to penetrate the soil mass deeply before you start giving it additional nutrition. In subsequent years, a good rule of thumb is to measure the diameter of the tree’s trunk. One pound of fertilizer per inch of trunk diameter is a good annual fertilizer rate, but space out feedings so it’s applied gradually over the course of the year and water it in well when applied. When fertilizing, try to fertilize in a four-foot ring around the tree’s base. This allows the nutrients to penetrate to a wider area, and the roots are more easily able to absorb them as needed. 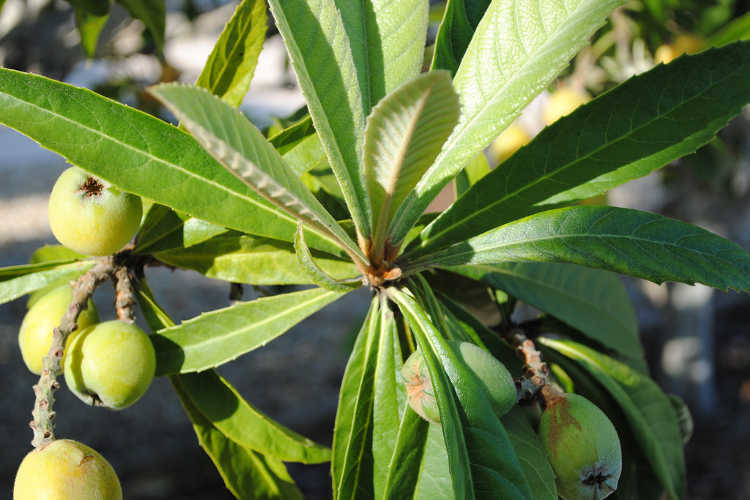 Loquat trees can be propagated by seed or by grafting. However, ones grown from seed take much longer to become established and are not as reliable at producing fruit as grafted trees from established rootstock. If planting from seed, the seeds need to be fresh. Remove the seeds from the fruit and rinse them well to remove any residue from the inside of the fruit, and plant shortly thereafter. Do not allow them to dry out before planting, and if you must, keep them wrapped in moist paper towels until you can plant. Grafted loquats are available from a number of nurseries, and I highly recommend going that route as you are guaranteed to have a much more viable fruit tree. Transplanting loquats is fairly easy. Begin by preparing the soil where you wish the tree to be planted, working it to loosen the soil in at least a 4-foot circle around the area where you plan on planting. Once the soil is loosened and a hole has been dug for the tree, remove it from its container. Rinse off some of the potting medium to expose its roots, although you don’t have to remove it all. Place it in the hole at the same height it was originally planted, being careful to go no deeper. Make certain some of the new soil comes into contact with the roots, and fill the hole around it. Water it in well, and mulch to help prevent weeds from growing at its base. 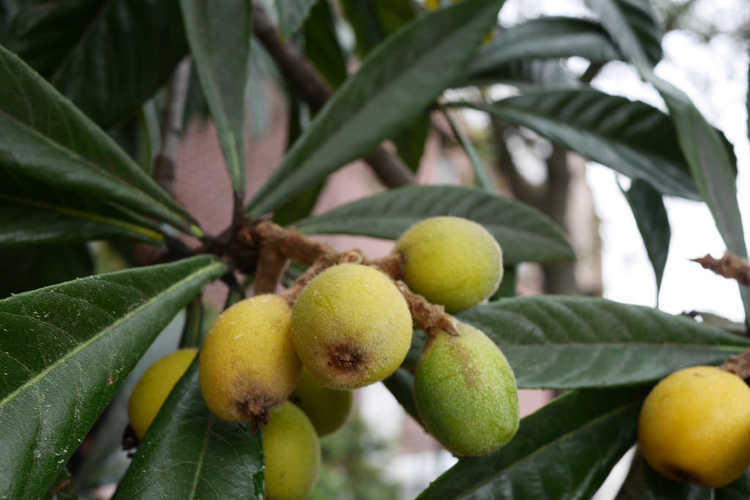 A loquat tree planted in a container should be repotted annually to replenish its soil, to move it to a larger container if needed, and to carefully trim the tap root if trying to keep the tree in a dwarfing or small habit. Be careful not to remove too much of the tap root so as to not greatly injure the tree, but light trimming will encourage your tree to remain small enough for its container and prevent the tree from becoming rootbound. Loquats grown in the ground need little more than an annual April trimming to help ensure light can penetrate into the center of the tree canopy. They can be cosmetically pruned to keep them in a particular shape if desired. Dead branches should be removed to keep the tree healthy, as well. It is quite possible to do the espalier fruit tree method. If doing espalier, pruning will be much more regular, but new growth tips will be carefully maintained to ensure that the tree can produce fruit. Container-grown trees can grow up to 2 feet per year and may need to be pruned to train them to a smaller, more compact size. The fruits are rich in vitamin A, potassium, manganese, and dietary fiber. They’re also low in sodium and saturated fats. Here’s how to harvest the fruit properly as well as to store it for your personal use! Ripe loquats tend to be slightly larger than unripe ones, and will give slightly when gently pressed. Their skin will be a bit darker than unripe ones, which gives you an indication of when to start checking. If left too long on the tree, they will fall off on their own but will be overripe. It’s easiest to harvest by trimming off the branch tip which the fruit is attached, taking down entire clumps of fruit all at once. Try to pick clumps where most of the fruit appears to be ripe to avoid waste. Slightly under-ripe fruit is still edible, but may be a bit less sweet and juicy. Overripe fruit is soft and mushy, and tends to be excessively sweet. While loquats are delicious and well worth growing, they all seem to come ripe at once. And while they’re wonderful for fresh eating, they only last for a few days once they’re ready. There is a definite “eat me now” period for fresh-eating purposes, after which they’re no longer suitable. Happily, whole fruit can be popped onto a cookie sheet in the freezer and frozen until solid, and then stored in a freezer bag until ready for use. When thawed, it will be soft and a bit mushy, but makes for an excellent syrup or jam material. You can also preserve your loquats by making jams, jellies, and syrups. As it’s low-acid, you may need to add additional acid for proper canning purposes. The fruit reputedly also tastes good when pickled, and it’s also suitable to make wines and liqueurs. It can be used in secondary fermentation for beer as a flavoring. Surprisingly, these trees have very few problems that you’ll need to contend with. Still, let’s go over those problems so you know what to do if they should appear! The most common growing problem is leaf tip burn. This causes the tips of the leaves to brown and crisp up during hot periods of the year. Unfortunately, there’s really no solution for this, as it’s generally caused by heat in excess of 95 degrees. 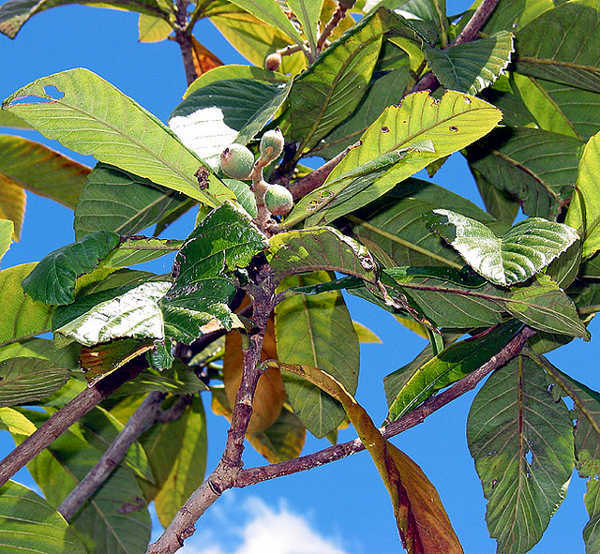 Ensuring that your loquat tree has ample water during heatwaves is the only preventative measure, but even that doesn’t always work. Tip-burned leaves will eventually drop off the tree on their own and be replaced with new leaves, so the problem will not last forever and is merely cosmetic. The two most prevalent pests are scale insects (especially black scale), and fruit flies. Scale insects can usually be treated by application of a horticultural mineral oil such as Monterey Horticultural Oil. The oil will coat the insects and smother them. This will work on any insects or larvae which are on the tree, but doesn’t prevent infect infestation once the oil wears off. Regular applications of horticultural oil should prevent the buildup of any further scale, plus will act to kill off aphids and their eggs should they appear. While aphids are not as drawn to loquats as scale is, they are relatively common in California, but the oil will keep them at bay. Fruit flies, the other major pest of loquats, are a bit trickier to deal with. The maggots of the fruit fly will burrow into the fruit and will cause it to rot and fall from the tree. Cleaning up fallen fruit before the maggots can emerge will help keep the population low. However, the only real prevention methods are to use a fine-meshed bag over the fruit to protect it from fruit fly colonization, or spraying of chemicals which repel fruit flies. There are also lure traps available which have some effectiveness. Some forms of caterpillar, particularly the larvae of the codling moth, may also try to infest your fruit. Exclusion bags (the fine-meshed bags I just mentioned) can help prevent them. Spraying of bacillus thurigiensis (BT) will also keep them at bay. Finally, both birds and deer can become pests. Birds love the fruit, and will happily devour any which they can get to. Deer nibble on the foliage, finding the new growth and the fruit particularly tasty. While exclusion bags will help protect your fruit from nibbling by the wildlife, it won’t protect the leaves. If you have a short tree, it might be wise to try to ensure that deer can’t reach it by other means (fences, etc). While not susceptible to many diseases, your loquat tree is at risk of two different forms of blight: fire blight, and pear blight. In areas which have late spring or early summer rain, or which have high humidity, fire blight is relatively common. Transmitted by bees, it turns young shoots brown and kills off the leaves. There are some bactericides which are used to help prevent fire blight, but once the young shoots are infected, they need to be removed and destroyed. You will need to cut back infected material well into green and healthy wood to prevent its spread. Pear blight acts similarly to fire blight, but is only particularly common in California. The same treatment applies, as both are bacterial infections. Other than that, it can develop fungal leaf spots if airflow cannot easily penetrate the tree canopy. Keeping it pruned to allow light to the center of the tree can prevent most fungal diseases entirely. 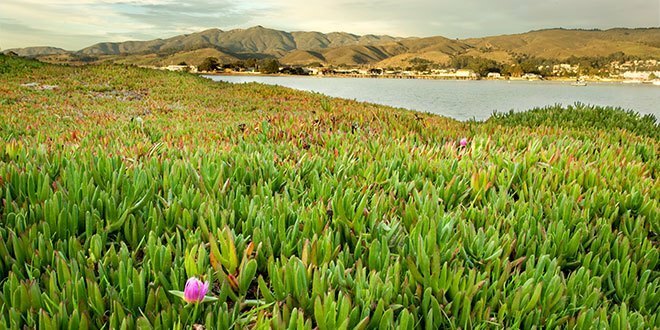 An application of Monterey Liqui-Cop will knock back outbreaks. 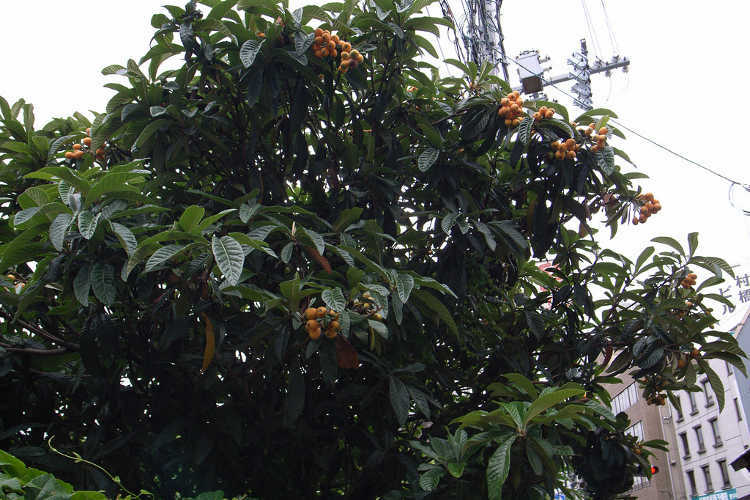 Q: Are loquat and kumquat trees the same species? A: Nope! In fact, while the fruit appears somewhat similar, they’re entirely different species. 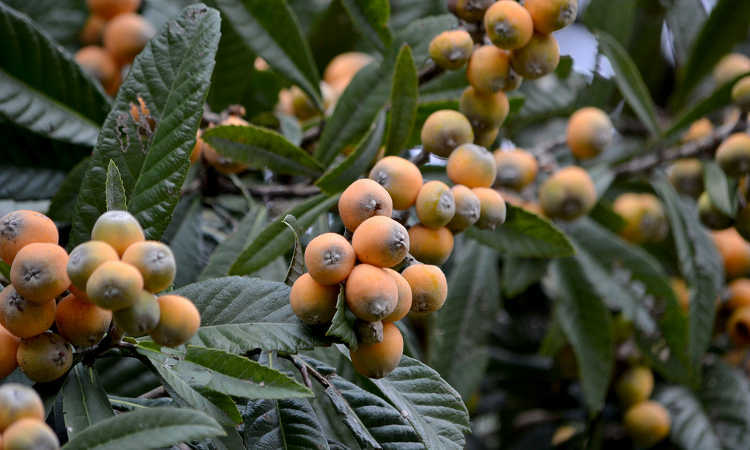 Loquat is Eriobotrya japonica, part of the Rosaceae family and related to plums, apples and pears, whereas kumquat is Citrus japonica and a relative of the mandarin orange. 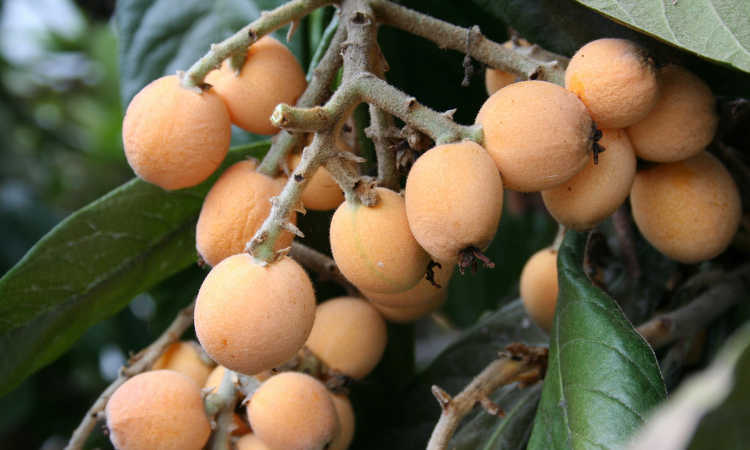 The loquat’s name actually derives from being mistaken for a kumquat. The term “lou qwat” in Chinese literally means “black orange”, and was a reference to unripe kumquats. My loquat is slowering a lot right now (January). Just wondering what sort of time of year they will start to show fruit? Also just wondering about different types of Loquat trees? I’ve heard the fruits can taste very different depending where in the world they have come from. Any info you may have on this would be amazing! It’s really hard to say without knowing the variety you’re growing. There’s at least 14 varieties which are commercially grown, and dozens more beyond the popular commercial types. If it’s flowering in January, though, you’re likely to see fruit fairly late, March-April would be my guess. As for the different types, all loquats have their origins in China, specifically southeastern China. They were introduced to Japan and have been grown there for at least a thousand years, but are also popular in India, Israel, Brazil, and other tropical climates. Loquats were introduced in California in the 1870’s, and are believed to have been brought to Hawaii by Chinese immigrants. 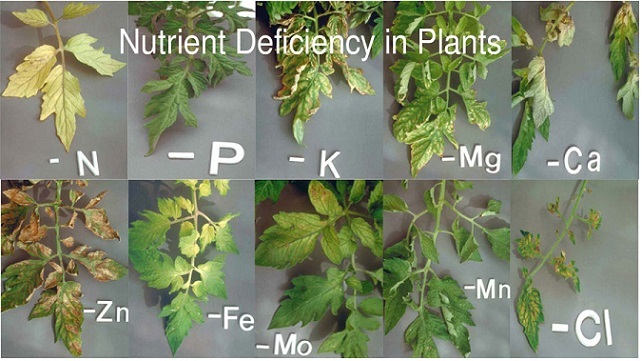 Like any other plant, different soils will produce different flavors, but the varieties have a direct impact as well. There are both orange and white fleshed loquat varieties. Some can be sweet, others can be slightly acidic or a bit tart. For instance, most of the loquats that come from Japan are the Mogi variety, which is an orange-fleshed version with light yellow skin. They tend to be on the sweet side. By contrast, Big Jim is a variety developed in San Diego, and it tends to have an acidic bite underlaid with sweetness. It’s got orange-yellow flesh with slightly-thick orangish skin. And Victory is a variety which is extremely popular in western Australia. It’s white fleshed with orange skin and is apparently a perfect dessert fruit with loads of sweetness. Now, how much of the flavor differences come from the soil as opposed to the variety, I’m not sure. 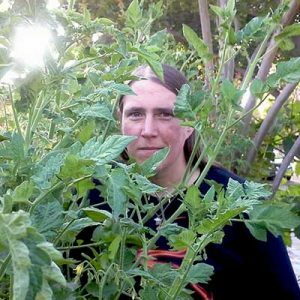 I can tell you that I’ve grown edible plants of the same variety in two different regions and had two very distinctly different flavors, so soil makeup and nutrition does have an impact. But the variety is probably going to be the major cause of flavor differences, and the soil in a particular region’s likely to be the secondary factor. 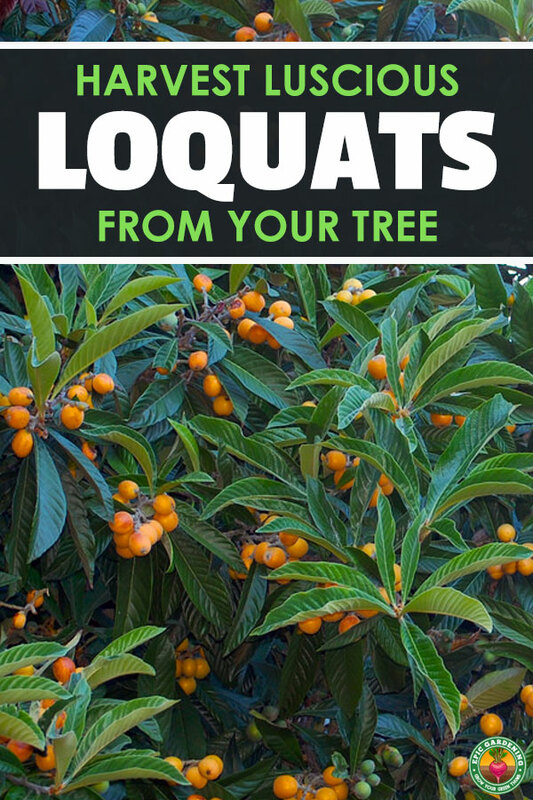 This was a excellent informative post you have shared on this page about the loquat tree because loquats are delicious, nutritious, and quite fun to grow if you’re in the right climate to do it. The evergreen tree is a beautiful ornamental species, but when you add on the perk of having fresh fruit, it’s definitely worth growing. I agree entirely! 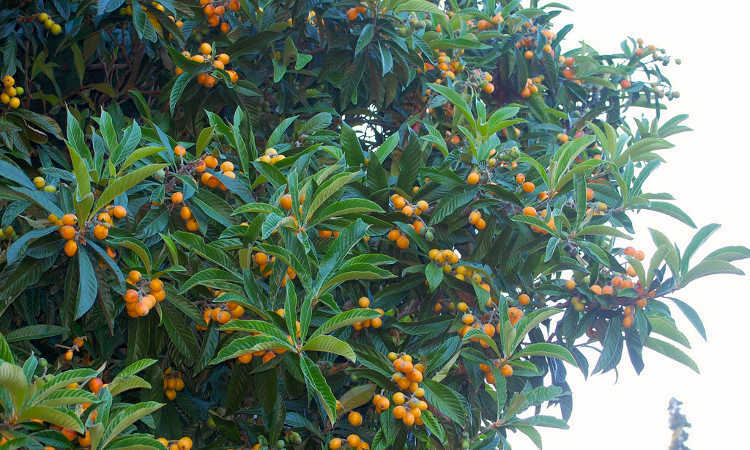 Loquats are fantastic fruit, and the tree’s pretty even when it’s not producing snack food! Thanks for the article. It’s very helpful. We just bought this new place with a garden where there’s a loquat that’s quite big. I would say about 20-25 feet high. It’s bearing fruits now. However, the fruits don’t look as big as from another one (the tree is smaller, too) we have in the park next to our place. Our tree don’t look very heathy (compared to those in your photos). Leaves are dark, trunks look old and mouldy. The tree is way to high so we have to climb up to pick the fruits (when they are ripe). The question I’d like to have is how should we prune/revive the tree? Should we cut short one big branch now and then another one the next year. And what month/season is the best time to do it? We live in Melbourne, Australia. Thanks a lot. TJ. Loquat can be pruned quite heavily and it will recover. I chopped off 4′ of my tree and quite a few major branches, and new growth started to come out of everywhere. I’d do it in the off season, when the tree has already produced all of its fruit for the season, but before it flowers for next season. Just be sure you cut less than 1/3 of total matter off the tree. Thank you, this is the best article I found about the loquat. Our tree is producing wonderful flowers this year (it has been warm in England). The tree is growing in a fairly small London garden and its size is soon going to be a problem but we shall wait until April to shorten some of its branches hoping that there is no risk. Waiting until April would be best, yes! You can trim back the branches to shorten them, but try to leave some budding growth on the branches so it can continue to branch out. If you need to thin the canopy, that would be the best time to do that as well. The plant will develop more leaves and young growth throughout the spring and summer months.